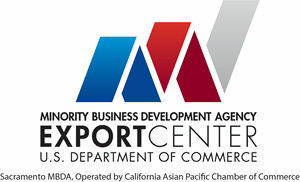 California Center is partnering with CalAsian Chamber of Commerce to assist the U.S. Department of Commerce/Minority Business Development Agency (MBDA) to foster the growth and global competitiveness of U.S. businesses that are minority-owned. The main goal is to help boost economic vitality and exports from the U.S. There are also a lot of advantages to small and minority business owners who do not export, like grant opportunities, access to capital, etc. In addition, you will get a free corporate membership valued at $2,500 with the CalAsian Chamber of Commerce who houses the MBDA export center in Sacramento. *An MBE is defined as a business that is owned or controlled (greater than 50 percent) by the following persons or groups of persons that are also U.S. citizens or resident aliens admitted for lawful admission to the United States: African Americans, Hispanic-Americans, Asian and Pacific Islander Americans, Native Americans (including, Alaska Natives, Alaska Native Corporations, and Tribal entities), Asian Indians, and Hasidic Jews.